Real men use three pedals. It’s a saying that resonates with a lot of motoring enthusiasts, but loses substance when you spend several hours in urban traffic, pressing and releasing your clutch a million times. It’s because of this very reason that the Toyota Innova and Mahindra XUV500 didn't have the best relationship with the left foot, thanks to the lack of an automatic gearbox. Boil them both down to their body styles and you get an SUV against an MUV, but there’s more to it than meets the eye. The Innova’s very foundation in India began with Toyota’s decision to launch it as a replacement to an SUV i.e. the Qualis. While it wasn’t feature-loaded, the model’s bulletproof reliability made buying it an involuntary action for many. While fleet operators lapped the MPV right up, it also became the ultimate second car for many who had expensive luxury cars as their primary ride. The XUV500, on the other hand, was introduced to satiate a very specific need; to fill in the gap in the Rs 10 to 20 lakh SUV space, so people with entry-level brutes like the Scorpio and Safari didn’t have to use their home as collateral for a loan when upgrading. Also, with the SUV craze kicking in, it became the ultimate alternative to same price luxury sedans. Mahindra’s crown prince offered a battalion of features, comfortable interiors and a potent engine, all at a value-for-money price. The formula was destined to succeed with many of the chinks in the armour being addressed with the 2015 facelift. 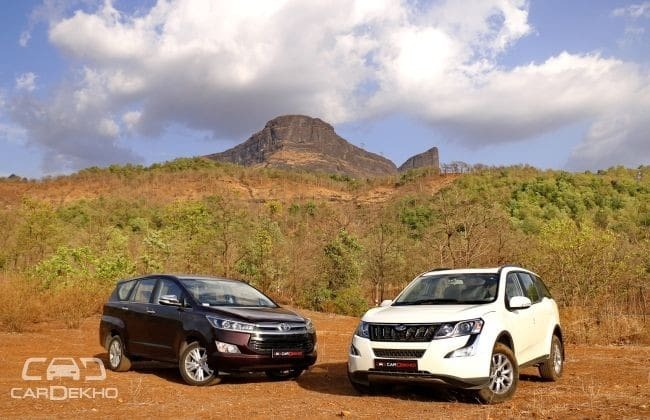 Despite their respective success, it wasn’t until 2015 that Mahindra launched the XUV500 AT and we had to wait for an entirely new-generation of Innova to get an autobox. Pardon the cliché, but better late than never. Your left foot can now breathe a sigh of relief, but there’s a good chance your wallet is confused. So we’re going to save you a lot of trouble and pit the XUV500 against the all-new Innova Crysta to see which one deserves a place in your garage! Put them side by side and it’s a tale of delicate and edgy vs aggressive and muscly. The Innova Crysta is the newer one of the two and, subsequently, looks more modern as well. New-age Japanese designers seem to have swapped their pens for Samurai katanas, as most of their designs have become a ballad of slashes and cuts. The MPV sports a wide and expressive face adorned with a twin-slat chrome grille that branches out into the sweptback headlamps. The chrome-kissed headlamp clusters are large and feature LED projector lights and LED light guides as well. You also get a black air dam, and the chiseled front bumper and bonnet add a muscular touch. Move to the side and familiar van-like overtones of the old Innova are evident. However, the Innova Crysta’s sharp shoulder line, meatier fenders and window-line kink help slim things down while adding a sporty touch, completed with 17-inch alloy wheels. The downward swooping roofline takes you to the rear where we see a ‘2.8’ badge as the only sign to identify the car as the automatic. The rear styling isn’t as busy as it is up front, but while the roof spoiler and sharp bumper look nice, the boomerang-shaped taillight is a bit too large for my liking. By no means is the Innova Crysta’s design neutral, but it is unisex, unlike the XUV500 which has no qualms in taking a haughty belch and claiming itself as a man’s machine. The SUV has a crouched stance, black front grille with chrome-accented slits, and black ‘tear duct’ accents that sit behind the chrome-embellished fog lamps. Flared bonnet edges make it look more imposing, but the S-shaped LED light guides look like an afterthought. The side profile is highlighted by the ‘paw-type’ door handles and beefed-up rear wheel arch. Even the XUV500 gets 17-inch alloy wheels, but the Toyota has a better wheel design. The rear end gets an ‘automatic’ badge to distinguish the two-pedal variant and while the rest of the arrangement doesn’t give you much to talk about, it isn’t as loud as the Innova Crysta’s derriere, save for the chrome applique above the number plate. The appeal of the exterior designs may be a matter of personal choice, but there’s just no comparison when it comes to the interior; the Innova Crysta is easily better. It comes packed with features and within two seconds of getting into the driver’s seat, you’re transported to a luxury lounge. The dashboard looks futuristic and you sit nestled behind a premium command centre with the black dashboard cut in the middle by a large wooden panel. Also seen are dull silver surrounds for the AC vents and 7-inch touchscreen infotainment system that supports AUX/USB/Bluetooth and navigation. The cabin doesn’t just please the eyes, but bits like the leather upholstery and padded door armrests are good to touch and feel as well. Aesthetics don’t trump functionality and you get steering-mounted controls that feel nice to use, automatic climate control with small but premium buttons, and the auto up/down function for each power window. The driver also gets an 8-way adjustable electric seat and a 4.2-inch multi-information display (MID). All three rows offer great space and the seats offer impressive all-round support. If you’re buying the automatic to drive on weekends and have a chauffeur for weekday traffic, the Innova Crysta offers a great second row, too. You get comfortable captain seats, rear air-conditioning, fold-out trays, a classy blue ambient lighting system and a one-touch tumble forward seat for easy access to the third row. All the seats offer good visibility and though the interiors are dark, you don’t feel claustrophobic. The Innova Crysta’s cabin is literally one generation newer, but the XUV500’s cabin is a decent place to be in nonetheless. The new black and beige combination looks classy, but the interior trim quality, while acceptable, isn’t up to the mark when compared to its rival here. There’s one too many textures and the plastic used for parts like the door pads and lower half of the dash feel average. However, you still get a laundry list of features like the 7-inch touchscreen infotainment system with a host of connectivity options and navigation, an electric sunroof, 6-way adjustable driver seat and steering-mounted controls. What’s missing, though, is the same feel-good factor. The buttons on the steering, for example, have the same feel as a computer mouse. The leather upholstery on the seat and steering wheel doesn’t have the same premium quality as the Innova Crysta’s and the cabin just feels like it could have been better put together. Space, though, is generous. While the Toyota’s second row is more comfortable, you can’t have three people here unless you settle for the lower, less-equipped variant, unlike the Mahindra which can seat three people here quite easily, irrespective of the variant. The Innova Crysta’s third row seats more people and offers better space than the XUV500’s last row, but honestly, it’s not wide enough for three adults. No fears for safety, since they’re both well-equipped and get ABS with EBD and ESP along with hill-hold control. The Innova Crysta gets 8 airbags, while the XUV500 gets 6, but Mahindra has also equipped its flagship with rear disc brakes and hill-descent control. There’s no two ways about it, the XUV500’s engine is proven and capable. The 2.2-litre mHawk diesel engine makes 140PS of power at 3750rpm and 330Nm of torque at 1600 to 2800rpm, and it comes paired with a 6-speed torque-converter automatic gearbox. The gearbox isn’t anything revolutionary and is purely there to help your left foot relax, because, if you know, the manual version’s clutch has a very long throw, even though it isn’t very heavy. The engine makes the gearbox look good as the healthy low-end torque delivery helps cover up some of the transmission’s laziness. At crawling speeds, just let go of the brake and the car will calmly move ahead and a little step on the accelerator is enough to get it up to city speeds smoothly. Slamming the pedal makes this SUV pick up pace quickly and while the engine does get loud, you’ll hit triple-digit speeds in no time. There are only two main problems. The gearbox doesn’t support aggressive downshifts and won’t please the enthusiast in you. Also, while you do get a manual mode, the toggle to operate it doesn’t feel nice to use and the gearbox will automatically upshift even if you want to hold on to higher revs. While the XUV500 uses a familiar motor, the Innova Crysta gets a new 2.8-litre unit that is exclusively offered with a 6-speed automatic gearbox. The power output of 174PS and peak torque of 360Nm give it an obvious upper hand. The gearbox is more responsive to throttle inputs and gear changes are noticeably smoother as well. Put the pedal to the metal and the car will push forward in a wave of torque, though the engine gets quite loud and the note isn’t pleasant. Simply put, you’re better off cruising. Neither one of them needs much effort for highway overtakes, but the Crysta’s manual mode is more fun to use since you shift the gear lever back and forth rather than fiddle with a little toggle. You also get the eco and power drive modes which will come in handy. Both cars weigh about the same, offer good in city driveability and are good highway cruisers, but apart from the fact that the Innova Crysta is quicker, it is also more enjoyable to drive. The Innova Crysta and XUV500 offer great bad road ability, but the Jap rides flatter and is a little less bouncy, which may come as a relief to last row passengers. The XUV500, however, has less body roll which makes it feel more composed when you hit corners at higher speeds. However, the steering calibration does change things a bit. The Innova Crysta’s steering is quite heavy which means you have to put in some effort to use it in the city and taking u-turns is particularly cumbersome. However, it is quite direct and reasonably communicative, so you can hit a few corners while having some fun. The XUV500’s steering is lighter to use in the city and weighs up well on the highway, but is very vague and there’s no feedback at all so you have to be a little more calculative. While both offer adequate braking power, the XUV500 gets rear wheel disc brakes and offers sharper bite, but both cars have noticeable nose dive under heavy braking. Throughout this comparo, the Innova Crysta has come out on top. It’s not just a better Innova, it simply is a better car. Period. By virtue of the fact that it is a new generation model, it gets a lot of advantages over the XUV500. The choice of looks will be subjective, but it is the better performer, offers the better cabin and is backed by Toyota’s reliability, after-sales experience and resale value. However, the MPV is also the more expensive option. The price difference between the base models is nearly Rs 2 lakh, even though the entry-level XUV500 automatic is better equipped. It gets a 7-inch infotainment display, 2 tweeters, automatic climate control, static bending headlamps, projector lights and more. The entry-level Innova Crysta misses out on a lot of such comfort and convenience features. In fact, you can have the range-topping XUV500 W10 automatic with all-wheel drive and it would still be a good Rs 2.60 lakh cheaper than the Innova Crysta ZX AT (rear-wheel drive only). Hand over heart, we’d still put our money on the Innova Crysta, but it’s recommended you opt for the top-end variant as the lower grades don’t offer much kit. If stretching your budget isn’t an option, then the XUV500 is still a fantastic package and offers great value for its price. Potent and convenient to use engine + transmission combination. Premium interior quality and generous space. Packed with comfort and safety features. Comfortable ride quality and decent dynamics. Toyota’s reliability and after-sales quality. Premium pricing, especially for the under-equipped base variants. Engine’s refinement and noise levels could be managed better. Heavy steering needs effort to use, especially in the city. Oodles of interior space backed by comfortable seats. Offers great bang for buck and is packed with features. Good ride quality and easy to use steering. Luggage space with all three seat rows up is inadequate. Imprecise steering gets tricky to use in corners.